A dental implant is a permanent solution to missing teeth. 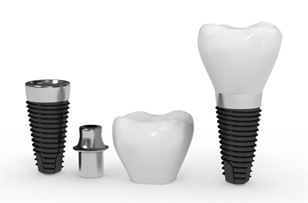 Adult patients of all ages are candidates for implants. Implants are considered long term restorations and provide excellent results that are comfortable, natural-looking and high functioning. To start, a small titanium screw is fitted into mouth like a tooth root. This dental implant is then attached into your jawbone to make sure it’s secure. A crown is then attached to the implant to make it look just like a real tooth. We also offer another type of dental implants. Mini implants are commonly referred to as MDIs. They are miniature titanium dental implants that act as tooth root replacements. These dental implants use titanium screws that have heads shaped like a ball. The ball-shape then allows the implant to snap into place. If missing teeth are causing you problems look no further for dental implants in Abbotsford. Our dentists have received their surgical training from the world authority on dental implants - Nobel Biocare – and are pleased to consult with patients about all aspects of your dental health. Contact our office to see which of our Abbotsford Dental Implants is the right choice for you!